A month ago we held the annual club awards at the Masterton ‘Cossie Club’. Once again, as a club I feel we should congratulate ourselves. There are some wonderful photographs among the winners, representative of an improving overall standard in the club. Many of the trophies have been donated by past distinguished members of the club, as you can tell from their names. 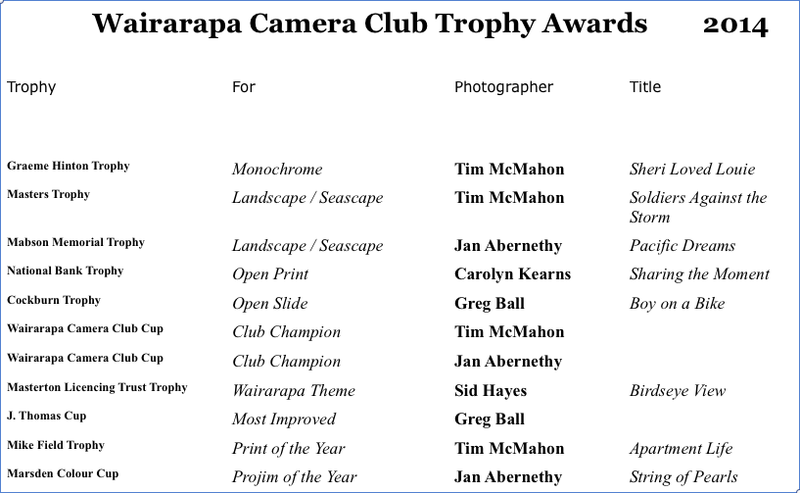 No doubt, the donors hoped that the cups and trophies would provide an incentive for current members to continue to improve their their photography. The continually rising standard of monthly entries suggests that we are achieving this goal. Excellent! The awarding of the trophies not only rewards current good practitioners, but remembers photographers of the past. Each trophy, as is the way with these things, records the names of all previous holders. Many members have come and gone from the club during its existence. The trophies ensure that not all of the names will be forgotten. The trophies provide an insight into the history of the club, even if the names that appear are only those who were good enough, or lucky enough, to persuade a judge on a particular night, that their image was better than a number of other equally worthy images. One of our projects for the new year will be to upload all of the past trophy and cup winners to a page on the web so that all members, rather than only the current holders, may be able to look at this piece of our history. As in 2013, Kevin noted that there were a number of trophies not awarded because our programme had not included the appropriate categories: for example there are trophies for sports action, portraits, and natural history that weren’t awarded this year. The themes on the syllabus are, of course, dictated by members’ interests. Not by the existence of the trophies. Next year’s syllabus is even more removed from the trophy list which will be interesting. Perhaps there is a case for re-purposing the trophies. If you have any suggestions the committee would like to hear from you. A ‘Reply’ to this post would do! This entry was posted in News on December 16, 2014 by Compsec Waicam.